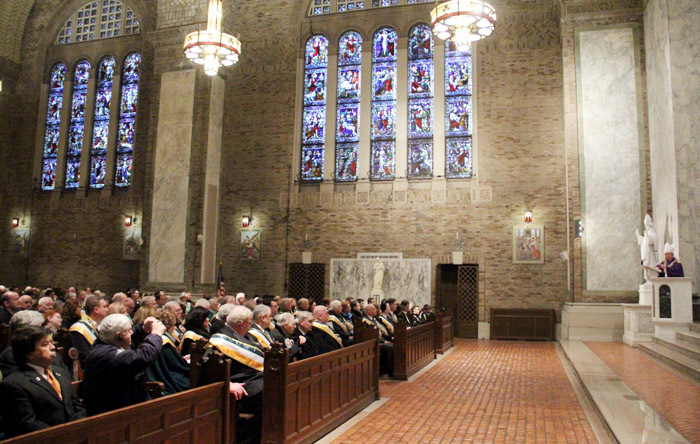 The Dominican Friars of the Province of St. Joseph (Order of Preachers) will take up ministry in St. Patrick Parish, in the Rittenhouse Square area of Philadelphia, on July 1. Although there was a Dominican presence in the diocese in its earlier years there have been none for the past two decades. There are two affiliated congregations of women religious, the Rose Hawthorne Dominicans and the Dominican Sisters of Peace, in the diocese. According to a Jan. 28 news release from the Archdiocese of Philadelphia, the first contingent of Dominican priests to come will be four friars — two for parish ministry, one for high school ministry and one to assist in various ministries. St. Joseph Province, the mother province of four Dominican provinces in the United States, was established in 1805. It has about 300 priests and brothers. At this time there are about 70 men in formation for St. Joseph Province, mostly for the priesthood but a few brothers as well, according to Father Thomas More Garrett, the associate executive director for the Dominican Friars Foundation. Showing a trend that is rare in this generation for either secular or religious clergy, the average age of Friars in St. Joseph Province has been getting lower not higher, according to Father Thomas, who himself is a native Pennsylvanian. He has a law degree and practiced at a center city Philadelphia law firm for a few years before entering the Dominicans. The exterior of St. Patrick Church, Philadelphia. If you are not familiar with the Dominicans, or properly speaking, the Order of Preachers, you surely know their saints. Try St. Dominic (1170-1221) who is their founding father, St. Albert the Great, St. Catherine of Siena, St. Martin de Porres, St. Margaret of Hungary, St. Rose of Lima, St. Raymond of Penafort, St. Vincent Ferrer and the great Doctor of the Church, St. Thomas Aquinas. Now Fra Angelico is only beatified, but his paintings are truly beatific. A present-day Dominican who is read by many Catholics constantly is Father Peter John Cameron, O.P., the editor of the monthly devotional magazine, Magnificat. The first Dominican to come to Philadelphia, according to diocesan histories, was Father William Harold, an Irish Dominican who arrived in 1808 with letters of recommendation from his bishop and provincial. His original intent was to serve in New York where Bishop Richard Concannon, also a Dominican, had been named that city’s first bishop. But Bishop Concannon had not yet arrived due to blockades during the Napoleonic wars. Bishop Michael Egan, O.F.M., at the same time was appointed Philadelphia’s first bishop and was already in Philadelphia, so Father Harold came here. Bishop Egan not only accepted him, he made him the first vicar general for the diocese. At a later date he was also vicar general for Philadelphia’s second bishop, Henry Conwell. This was the time of the bitter disputes between lay trustees of St. Mary Church and the bishops, and while Father Harold strongly opposed the trustees and was an excellent preacher, he had a strong take-charge personality. According to the histories, that led to quarrels with Bishops Egan and Conwell and ultimately he returned to Ireland. A bit later we see another Dominican arrive in Philadelphia, Father John Dominic Berrill, the founding pastor of St. Dominic Parish in the Holmesburg section of the city in 1849 and later pastor at St. Stephen, Philadelphia. The longest Dominican ministry in Philadelphia was at Holy Name of Jesus Church in the Fishtown section of Philadelphia, where members of the order ministered from 1912 until 1998 while also serving for a time on the faculty of La Salle University. St. Patrick Parish, where the Dominicans will now minister, is one of the crown jewels of the church in center city. The church itself is located at 20th and Locust Streets just around the corner from Rittenhouse Square, Philadelphia’s loveliest public garden. The neighborhood was quite different when St. Patrick Parish was founded in 1839 with Father Daniel F.X. Devitt as the pastor. It was literally on the edge of the city whose western boundary at the time was the Schuylkill River. Older city maps show the area sparsely settled and dotted with clay pits dug for the manufacture of bricks. There was also the Schuylkill River waterfront which was very active then, most especially in bringing coal down the river from the upstate mines. The waterfront area was where many of the early immigrant parishioners lived and were employed. On paper at least, the new parish covered an immense territory stretching far beyond the city. Father Devitt built his first frame chapel on a lot that formerly sited a carpentry shop and vinegar factory. The land for the present church was purchased in 1841 but it was years before the parish could pay off the debt from the purchase and construction. The building as designed by Napoleon LeBrun, the architect of the Cathedral Basilica of SS. Peter and Paul, was finally consecrated in 1871. By this time the Rittenhouse Square area became more and more gentrified, although the prosperity did not immediately affect the dockside working-class Irish Catholic immigrants and their children. Indeed, according to old histories, the contributions of the “living out girls” were essential to their families. They were young Irish women who worked as live-in servants to the gentry. One noteworthy benefactor was Thomas Cahill, a self-made coal and ice magnate. Cahill was a good friend of the second pastor, Father William O’Hara, later the founding bishop of the Diocese of Scranton). While Cahill was a generous supporter of his parish, he is best remembered for his bequest that built and endowed Roman Catholic High School, the city’s first diocesan high school. Today’s St. Patrick Parish and Church are far removed from its beginnings. With a registered population of about 1,700 it has a very high but transient Mass attendance rate compared to registration. Father Daniel Mackle, St. Patrick’s current pastor, will be moving on to St. Charles Borromeo Seminary where he currently teaches classes in liturgy and where will be the seminary’s director of liturgy. He well remembers when the parish was much more a typical Philadelphia city parish complete with a school, because his family roots are in the parish. While St. Patrick’s lost registered population as the area became less residential, others took the place of the Irish families of yesteryear. This especially includes young adults drawn from directly across the Schuylkill River in University City, the home of the University of Pennsylvania, Drexel University and the University of the Sciences. Many young millennials, especially graduate students, either living in the parish or crossing the bridge, attend Mass at St. Patrick and if married have their babies baptized there. They tend to move on after completing their studies, Father Mackle explained. People visiting Philadelphia either as tourists or conventioneers and staying at the hotels in the area also contribute to the Mass attendance. 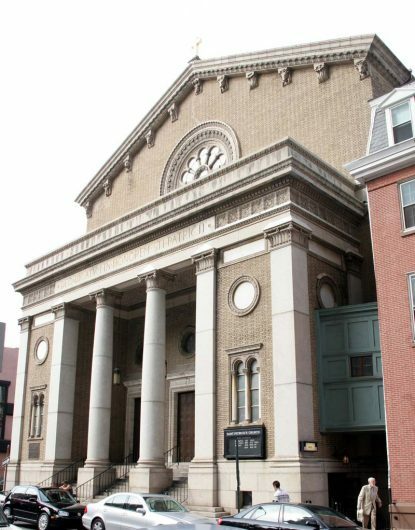 Like the other center city parishes, the stately church is also is a favored wedding venue for couples having a wedding reception in the area. 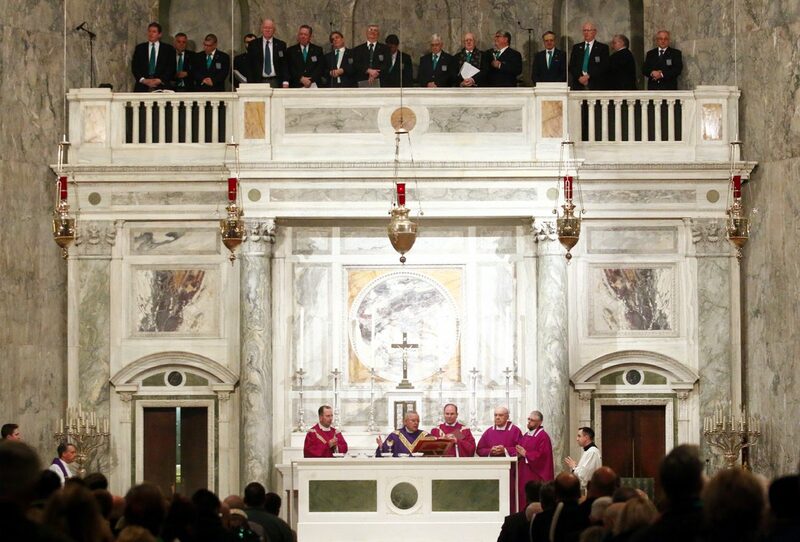 And let’s not forget the traditional St. Patrick’s Day Mass which precedes the annual St. Patrick’s Day Parade. The Dominicans are indeed inheriting a vibrant ministry with a tradition of almost 200 years. It is not unusual for religious orders and congregations to be in parish ministry in the Archdiocese of Philadelphia. At its foundation there were no diocesan priests if for no other reason there was no diocese. At this point, according to the latest Catholic Directory of the Archdiocese of Philadelphia, there are priests of the Augustinians, Capuchin Franciscans, Incarnate Word, Jesuits, Mercedarians, Missionaries of Mary Immaculate, Missionaries of the Sacred Heart, Norbertines, Oratorians, Redemptorists and Vincentians. Mostly they are working in pastoral ministry at more than 20 parishes within the City of Philadelphia itself. And now we have the return of the Dominicans. Welcome aboard. Thanks, Lou Baldwin, for this history! !